Mexican food is always a big hit at my house. We LOVE it and I usually make something with a Mexican twist at least once a week. Today I’m sharing 15 of my favorite Mexican recipes. So weather you’re looking for a slow cooker recipe like Slow Cooker Shredded Beef Enchiladas or something fast like Baja Shrimp Ceviche Tostadas you there’s something on this list for you! Savory shredded beef and enchilada sauce make these Slow Cooker Shredded Beef Enchiladas out of this world good! In just 20 minutes you have these delicious Baja Shrimp Ceviche Tostadas on the table. Trust me you’ll be California Dreaming about these tostadas! One of our new favorites is this Spicy Mexican Chicken and Rice this easy recipe it perfect for busy night because everything cooks in a single pan in just 30 minutes! These Chili Lime Mango Pork Carnitas are a great slow cooker recipes with layers of amazing flavors. 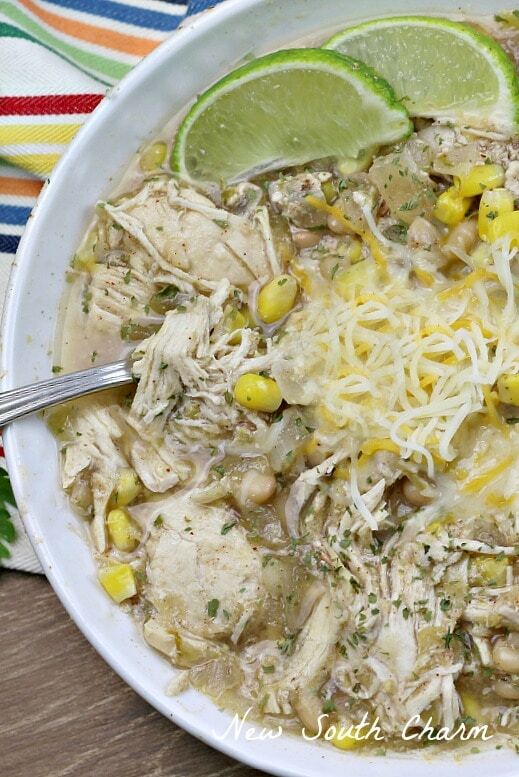 Slow Cooker Salsa Verde Chicken Chili is not just a cool weather recipe. This flavors in this recipe make this a chili you can enjoy all year long! I can’t think of another ingredient that says Mexican food like Chorizo. If you’re a fan of this spicy sausage like we are you’re going to love this recipe for Chorizo Enchiladas! You’re going to love this easy One-Pot Chicken Burrito Bowl! Make a big batch for lunch all week!!! 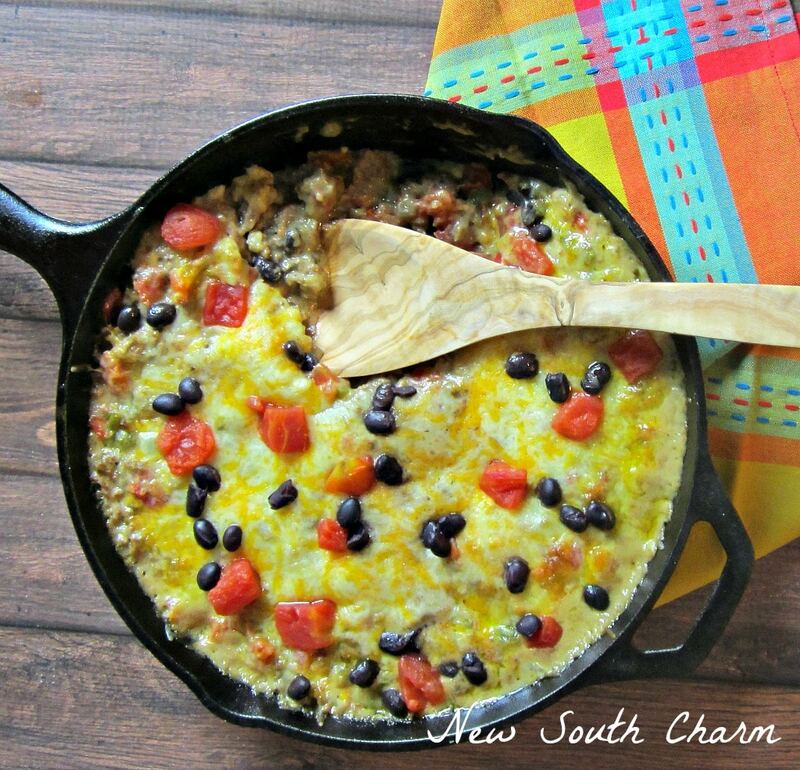 A long time favorite around here is this Easy Enchilada Casserole. Lots of layers and a touchy of smokey flavor from Green Enchilada Sauce make this easy, budget friendly recipe a regular in our dinner rotation. 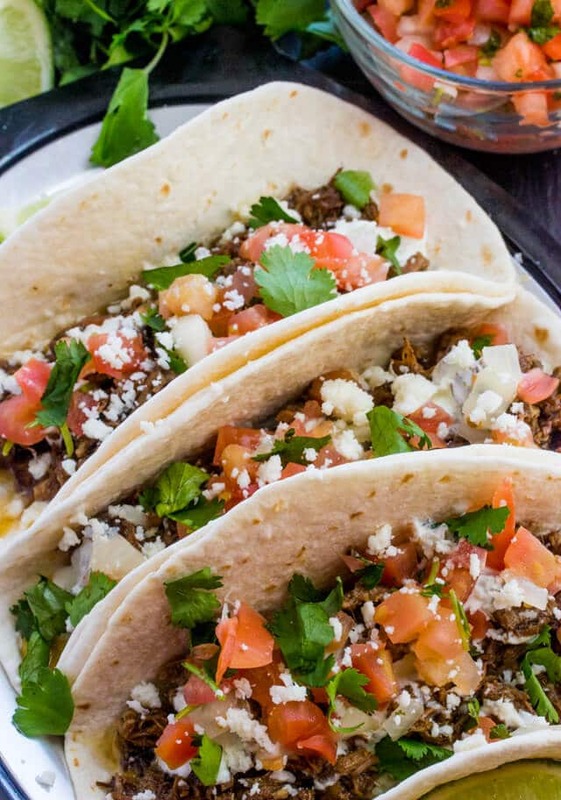 You don’t have to wait for Tuesday to enjoy these Slow Cooker Street Tacos! These steak tocos are full of great Mexican flavors! If you’ve got 15 minutes and a pound of ground beef you can make these Salsa Verde Beef Tacos. These are sure to become a new family favorite. One of our all time favorite Mexican recipes isn’t actually Mexican it’s an American twist on a Spanish flavors Skillet Taco Mac and Cheese. Looking for something different? Try these Beer Braised Beef Enchiladas. The layers of flavors in this dish makes these enchiladas incredible. Looking for something lighter? 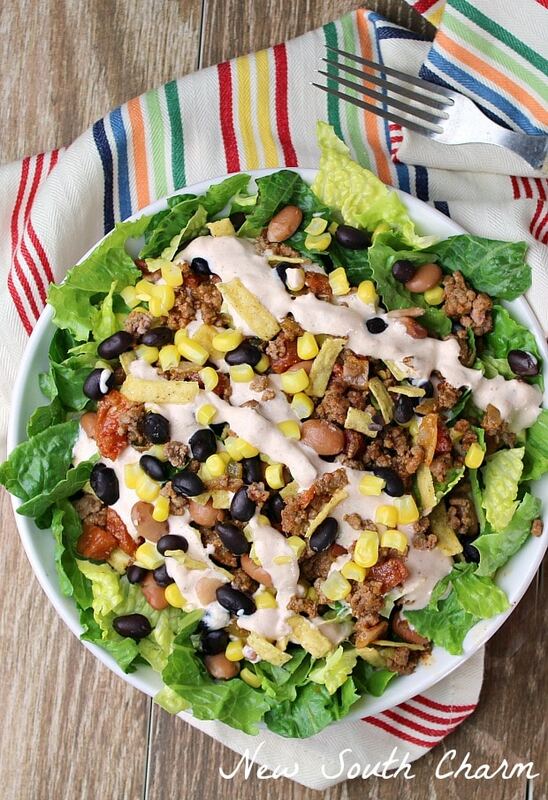 You’ll love my recipe for Loaded Taco Salad with Chipotle Lime Sauce. Don’t skip the sauce with on these this salad it’s the real start of this recipe! Of course a great Mexican dinner isn’t complete with out the sides dishes. So I’m including my two favorites. 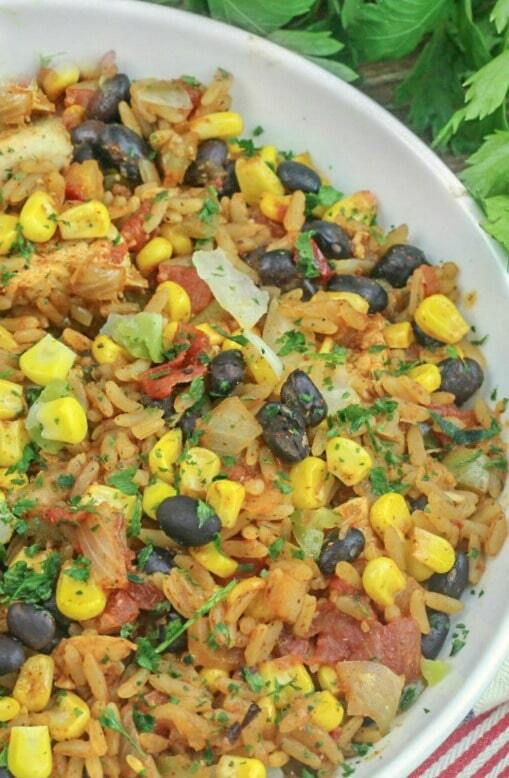 This Mexican Rice is restaurant quality and perfect to serve at a fiesta or on a weeknight! If you’re looking for add a bit of protein to your dinner? Then you’ll love these Seasoned Black Beans. Well that’s it my whole list. I hope you’ll find one or, well, fifteen new favorites. If you find a recipe you love come back and let me know. I love hearing from you!